Fate, family, and fortune all played vital roles in the creation of Trisaetum (tris-say-tum), a blossoming winery located in the heart of Oregon's Ribbon Ridge AVA. Founders James and Andrea Frey say it all began when they fell in love on their Napa Valley honeymoon--with winemaking. Less than 10 years later, James, a professional photographer and painter, still marvels at how he and Andrea committed themselves to two vineyard properties--22 Coast Range acres that needed to be cleared and planted in the southwestern corner of the Yamhill- Carlton AVA, and a 28-acre vineyard in the heart of the Ribbon Ridge AVA--just when his parents chose to retire. The elder Freys moved in and provided endless help and expertise as the land was prepared to plant several Riesling and Pinot Noir varieties. James, who named the winery Trisaetum after his children Tristen and Tatum says, "It's definitely a family business, with three generations side-byside on the sorting line during harvest." The first Trisaetum vintage was released in 2007 and subsequent vintages have received much praise from the press. 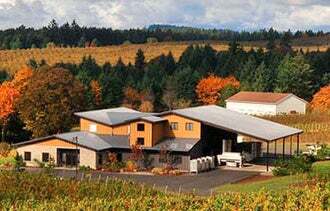 Wine Spectator listed the 2008 Trisaetum Pinot Noir as one of the top 15 Oregon wines of 2008. And Wine Enthusiast recently awarded the 2009 Trisaetum Josahn Riesling 94 points. "When it comes to winemaking, balance is critical. But once we have that, we want wines that are memorable, wines that are bold without being overpowering," James explains. "We want wines with great complexity, but not ones that are confused or muddled. Again, it comes back to keeping things in balance while still being wonderfully expressive." Besides Trisaetum's portfolio of more than a dozen Rieslings and Pinot Noirs, tasting room visitors are delighted to discover James' riveting vineyard-inspired artwork, displayed in an adjacent 1,500-square-foot art gallery. With vineyard dirt and vine cuttings sometimes used as elements, James demonstrates that his art can be as wonderfully expressive as his wines.